When I began the I Ching Modern Quilt-along, way back when, my life was running on auto-pilot. I had no idea catastrophe was about to hit - the abrupt ending of a romance and heart-break. I also had no idea that I would be signing up for a 9-week Mindfulness Based Stress Reduction workshop! Since beginning a practice of mindfulness meditation (45 minutes formal practice daily and informal practice while eating, walking, driving, stitching, knitting, etc) I am experiencing profound changes in my attitude towards life, career, creativity, relationships and dating. Fostering acceptance for how things are is difficult, and sometimes boring. I've felt deep sorrow at times, but also a new sense of aliveness, well-being, freedom, and a gentleness/true kindness of heart. Ah it feels so good! 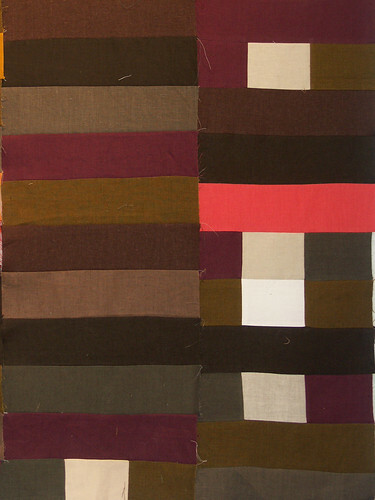 Mindfulness has seamlessly informed the process of making my I Ching modern quilt and vice versa. Making an I Ching modern quilt is a mindful meditation practice of non-doing, non-judging, acceptance, patience, impermanence, and non-attachment. Unlike other projects I'm working on in my studio, my judging mind is not called upon to make decisions. I am simply manifesting what the coins are prescribing. At first this was difficult as I mentioned in an earlier post on CONTINUING. 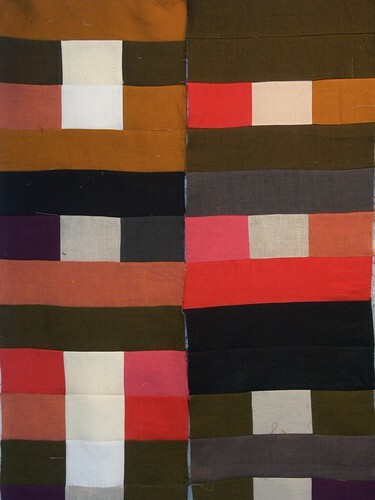 For example, in the fist half of column two, after throwing ten solid unchanging lines I began to worry that my quilt would be dark and boring, and that I would run out of unbroken dark strips. Then, in the second half of column three I threw almost seven broken unchanging lines in a row. Still dark but not as monotonous. I felt some relief. Recently in the first half of column four I threw six out of twelve changing golden lines. Even more relief because I was grasping and hoping for change and some color! Isn't this the way life is? Sometimes catastrophes seem to pile one on top of another, or all of a sudden we are counting multiple blessings. Our minds always labeling and grasping for what we judge as beautiful, comfortable, joyful and positive, while shunning or denying what is painful, disruptive, ugly and bad. From our human perspective the events of life appear random, and randomness is inconsistent... a string of dark rows followed by a string of golden lines. 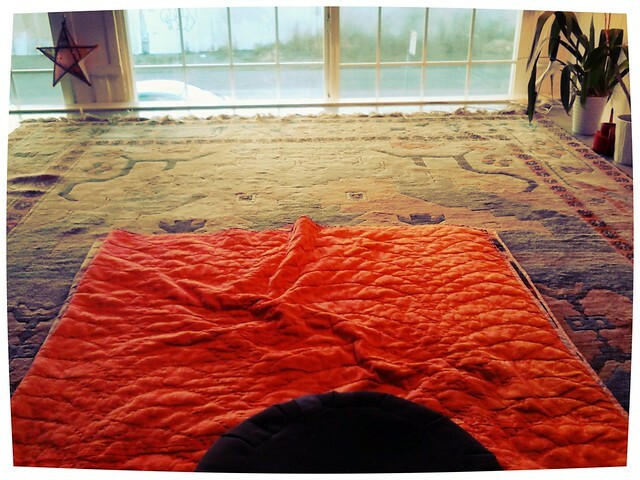 The light, dark, changing, and unchanging lines are NOT sprinkled harmoniously and evenly throughout my I Ching quilt. The clouds are above heaven: Waiting A noble one eats, drinks and relaxes with music. You wait for what you need, like a farmer waiting for the weather to change. It is a time for nourishment, eat, drink, relax. When you are fully present in waiting, your intense attention shines out like a beacon, beginning a creative engagement with the world -- not by working on anything but by waiting on it and holding your faith. Well HELL that is just the way it is... and isn't it beautiful! This process is about being not doing. Enjoy the break from judging, doing and being in control, accept whatever comes in your I Ching Modern Quilt. Mindfulness meditation is the simple act of focusing your mind on your present action and paying attention to your wandering thoughts and feelings as they arise. You don't have to stop your mind from wandering, just watch your thoughts, note them, then bring your attention back to the present task at hand. Practice mindfulness when you pick your strips blindly from your bag. How is your mind reacting to your picks? Practice mindfulness when you sew your strips together. Listen to the sound of your sewing machine, watch your hands move in sink with the machine as you feed your fabric under the needle. Practice mindfulness when you iron your sections. Feel the weight and warmth of your iron in your hand. Listen to the sound of the steam. In the previous step I talked about IRONING. In the next installment I will begin SEAMING my columns together. Please comment with any questions, discoveries, surprises, satisfactions or dissatisfaction you might have. It's never too late to join an online quilt-along! I'll be posting new segments of the quilt-along on Mondays. 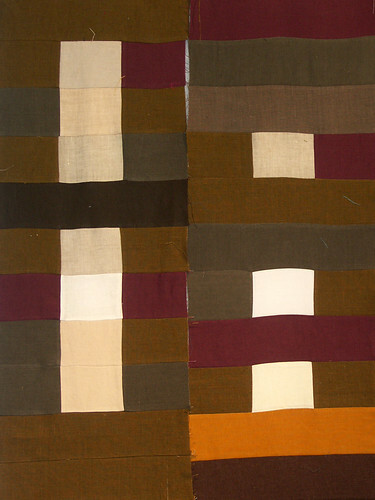 Access the archive and subscribe to the RSS feed here: I Ching Modern Quilt-along. I've set up an I Ching Modern Flickr Group if you want to share images of your sketches, process, and final results.